Growing up to eight feet long, the Masticophis genus of snakes called Coachwhip snakes, or whip snakes, get their name from their long, whip like appearance. Visitors interested in additional information on a variety of snakes can press the green Snakes button. In a technical note. Snake taxonomy changes and of late there is debate on whether to place these snakes in the genus Masticophis or genus Coluber, the racers. Any internet search using either genera will bring up these snakes. Basically the snakes in the Coluber genera, commonly called the racers and the whipsnakes or coachwhips, share both physical and behavioral characteristics. Most if not all species tend to be comparatively thin and very fast movers. The lengthy size of the coachwhips makes them an imposing figure. It’s hard to miss one when they are sitting on a hiking path, or curled up, and curled up and curled up some more in a tree. Fortunately, and contrary to popular myth, whip snakes do not go into attack mode, chasing and punishing humans in their vicinity. In fact, seeing one in the wild might be easier than photographing one. They are typically wary of human presence and often speed away when sighted. Coachwhips are also nonvenomous snake. Many species tend to be ill tempered and readily bite when handled. Otherwise, their diet consists of rodents and other small invertebrates, so they can be considered beneficial neighbors in most of their territories. Five species are found in the United States. The top picture shows a Red Racer (Masticophis flagellum). It’s probably the most common species, with subspecies living in states from Florida, west to California. The name Red Racer can be a bit misleading. Many of the subspecies have different color patterns from red to yellow to brown to dark to tan. 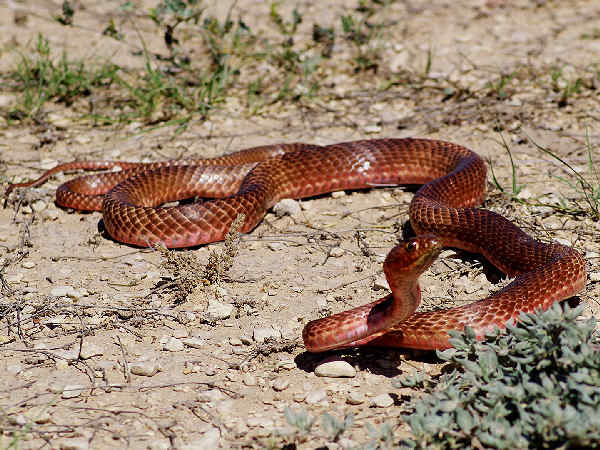 Body color in these snakes is very much a function of geography and climate. The wide range suggests they adapt to a variety of habitats, most with the traditional south sandy soils. Forest edges, fields and prairies all provide suitable habitat for these snakes. The U.S. 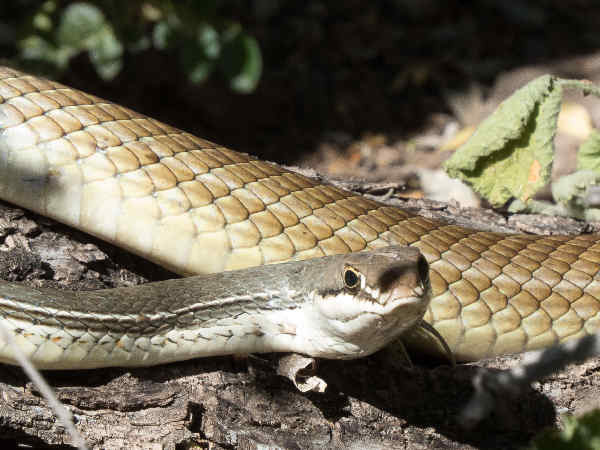 Fish and Wildlife Service (USFWS) lists three different Masticophis species with population pressures. Sonoran Whipsnakes (Masticophis bilineatus) have a very small presence in the Sonoran Desert areas of New Mexico and Arizona. Schott’s Whipsnake (Masticophis schotti), another separate species, has a small range in South Texas. It is primarily a Mexican species. 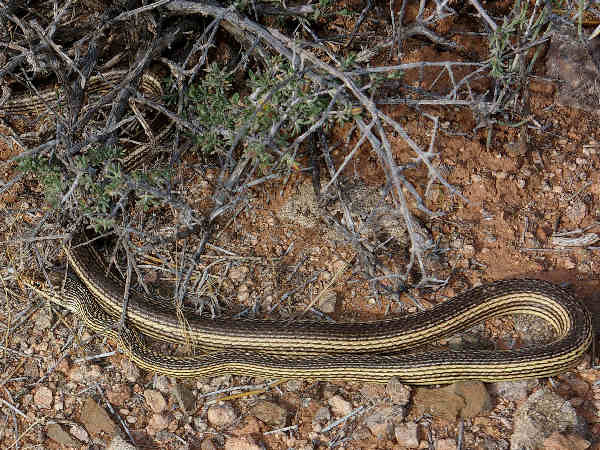 Striped Whipsnakes (Masticophis taeniatus) range through most of the Southwest, and as far north as the Oregon border. 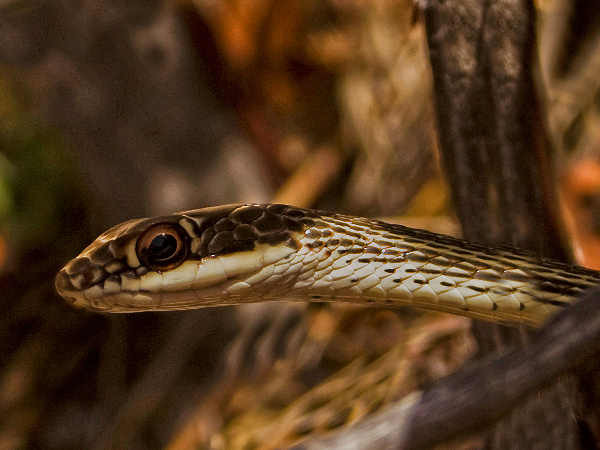 Here’s a close up of the face of a Striped Whipsnake. The fifth and final of the native coachwhip snakes, the California Striped Racer (Masticophis lateralis) limits it range to California. The state is so big in terms of territory that it’s a fairly common species to cross paths with, except for the very wet northwest portion of the state and the very dry southwest portion of the state. 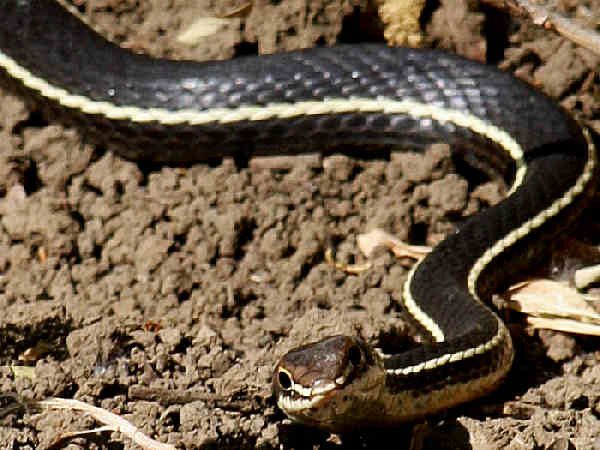 The black body with side stripes makes it a very easy snake to identify. Black Racer (Coluber constrictor) is the general name for one of the most widespread of all the snakes native to the United States. In fact eleven different subspecies inhabit almost every state in the lower 48 states. Color is a common name applied to many of the species as well as the Black Racer. 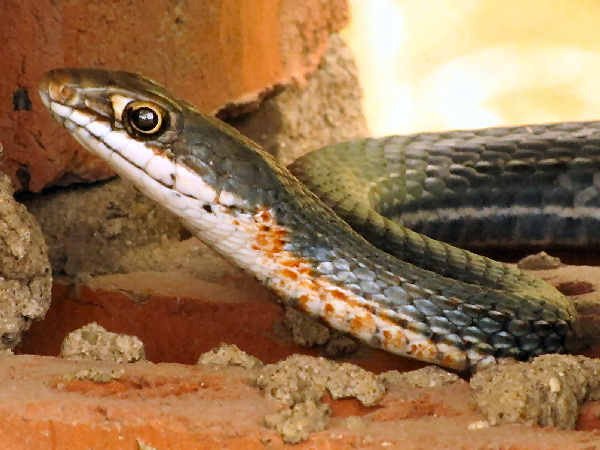 Blue Racers, for example are common around the Great Lakes region. 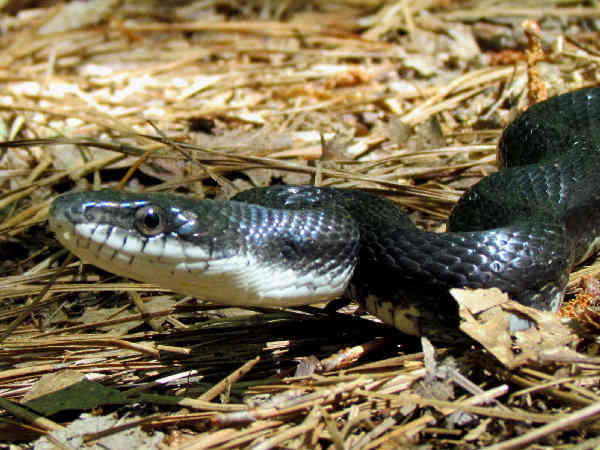 Black racers inhabit most areas in the East from southern Maine to the Florida Keys. 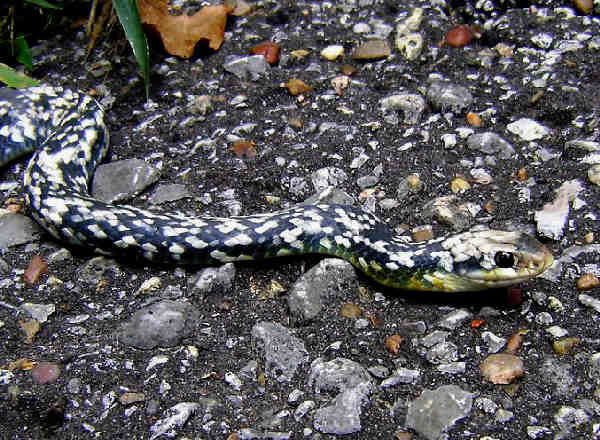 They are long, thin snakes with a black body, and as the picture highlights, white chins. The Buttermilk racer in the picture is native to Louisiana, with small populations spilling over the borders to Arkansas and Texas. Two subspecies of Yellow-bellied racers are recognized. 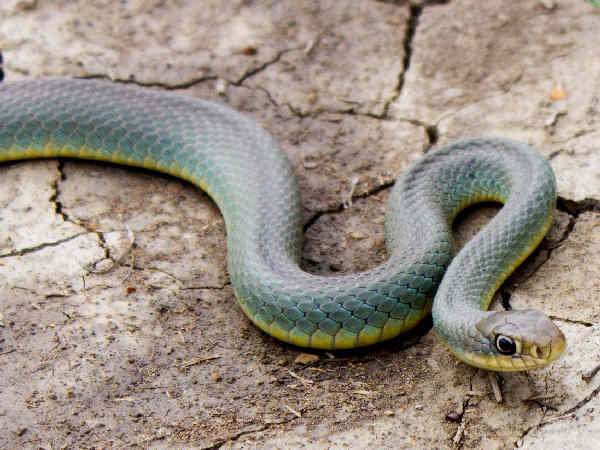 The Eastern Yellow-bellied racer is a Midwest native. West of the Rocky Mountains, the Western Yellow-bellied Racer prevails. The wide range suggests that racers adapt to a variety of habitats from grassy fields to forest areas. It’s as easy to cross paths with one in the back yard as it is on a hike in the woods. Like Coachwhips, crossing paths with a racer usually ends with the racer racing away as fast as possible.